The last surviving British member of the Dambusters raid has been made an MBE in the Queen’s Birthday Honours. George “Johnny” Johnson was 22 when he took part in the 1943 air raid using experimental bouncing bombs in Germany. The 96-year-old, who has been the subject of a number of campaigns to get him knighted, said the MBE was “as much honour” as he could “really expect”. He added he was “pleased” and “very grateful to all those who signed the petitions and made this possible”. 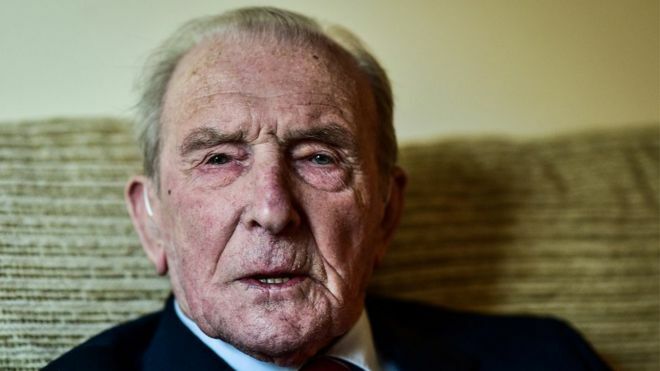 Bomb-aimer Mr Johnson, who now lives in Bristol, is the last British survivor of the 133-strong squadron which dodged anti-aircraft fire to drop the four-tonne skipping bomb on dams in the Ruhr Valley. Codenamed Operation Chastise, eight of the 19 planes were lost, 53 men died and three were captured. Squadron Leader George Leonard “Johnny” Johnson, DFM MBE (born 25 November 1921) is a retired Royal Air Force officer and the last British survivor of the original members of No. 617 Squadron RAF and of Operation Chastise, the “Dambusters” raid of 1943. George Johnson (known within the family as Leonard) was the sixth and last child born to Charles and Ellen Johnson. He was born in the village of Hameringham in the East Lindsey district of Lincolnshire, England. His mother died when he was three, leaving his father, a farm foreman, to bring up the family in somewhat poor conditions. The family lived in a tied cottage, his oldest sister Lena largely being responsible for his early upbringing. Volunteering to join the Royal Air Force in 1940 as a navigator, he was instead selected for pilot training. However due to the difficulties in processing the vast numbers of recruits at the time he was posted to various establishments around England and it was not until June 1941 that he was finally sent to Florida to begin his pilot training. As is common practice within the British armed forces Johnson’s surname led to him being nicknamed “Johnny”. Johnson did not make the required grade during his pilot training and as a consequence he opted to become an air gunner. In July 1942, Johnson was posted to No. 97 Squadron RAF at RAF Woodhall Spa where he was initially designated as a spare (reserve) gunner. This however gave him the opportunity to fly with numerous crews in the squadron, his first operational sortie being a raid on Gdynia in Poland on 27 August 1942, forming part of the crew under the command of Squadron Leader Elmer Cotton. En-route to the target the aircraft suffered an engine failure forcing the pilot to abort the mission and return to Woodhall Spa. The following night the crew were part of a successful raid on Nuremberg. Johnson continued on squadron operations as an air gunner until the opportunity came along for him to train as a specialist bomb aimer. Undergoing a course at RAF Fulbeck in November 1942, he returned to No. 97 Squadron filling the vacancy for a bomb aimer with the crew of Joe McCarthy. Initially Johnson showed reticence in operating with an American skipper, however having met with McCarthy he changed his mind. Johnson’s first sortie as part of McCarthy’s crew was as part of a raid on Munich on 21 December 1942, conducted in bad weather. Attacked by night fighters on their way to and returning from the target, the Avro Lancaster lost all power on one engine and developed problems in another, forcing McCarthy to land at RAF Bottesford. Together with this crew Johnson conducted a further 18 missions with No. 97 Squadron, bringing him to the end of a full operational tour, followed by a leave, after which he spent six months working in a non-combat training role. Selected to be part of the specialist No. 617 Squadron RAF, Johnson arrived at RAF Scampton on 27 March 1943. It was at this time that he was due to marry, however due to the requirements of the training for the upcoming raid all leave had been cancelled. Johnson appealed to his new Commanding Officer, Wing Commander Guy Gibson, who eventually relented giving Johnson four days leave. McCarthy’s crew in Lancaster AJ-T (T-Tommy) were detailed to attack the Sorpe Dam, the structure of which differed considerably from the other main targets insofar as it being an earthen dam as opposed to the gravity construction of the Möhne and Eder dams, thus necessitating a completely different type of attack. Like the rest of No. 617 Squadron, Johnson had practised dropping his bomb as the aircraft flew straight towards the target at low level. However on the afternoon prior to the raid when the five crews detailed to attack the Sorpe Dam received their briefing, they were told that they had to fly along the dam wall and drop their mine at its centre. It would roll down the wall and explode when it reached the correct depth. The specialist bomb sight developed for the raid would also be of no use. Following the Dams Raid, Johnson was commissioned in November 1943. As an integral part of McCarthy’s crew Johnson participated in a further 19 missions during his time with No. 617 Squadron until April 1944. By this time his wife was pregnant resulting in McCarthy insisting Johnson stand down. Reluctantly this request was accepted, Johnson was “screened” (classed as “tour expired” or, in effect, due for a rest from operational flying). He was subsequently posted to a Heavy Conversion Unit back at RAF Scampton where he became a bombing instructor until the end of hostilities. Johnson married Gwyn Morgan in April 1943, having met her during a posting to Torquay in 1941. Together they had three children, the marriage lasting until Gwyn’s death in August 2005. For a short time following his wife’s death he decided to withdraw from public life. However, alongside Les Munro, he was at the forefront of the 70th anniversary commemorations of the Dams Raids in May 2013. He now lives in Westbury on Trym, Bristol, and continues to give interviews on the various aspects of his active service and particularly concerning Operation Chastise. In 2015 he was awarded the Lord Mayor of Bristol‘s Medal. Johnson was awarded an MBE in the Queen’s Birthday Honours on June 16th 2017.